Work has been insanely busy, but I carved out a few hours on Saturday to try fixing the loom. Mike and I tried quite a few adjustments and checked lots of things, but weren’t able to figure out why shafts 36-40 are sporadically floating. At this point I’m thinking it may be related to the warp and the threading – I am using two warp beams, and have one warp threaded on shafts 1-20 and the other threaded on shafts 21-40. I’m guessing that the tension on shafts 21-40 is somehow too high, which is causing the float. But when I reduce the tension, threads start sticking. Foo. So after sober reflection, I’ve decided to cut off the shadow weave warp. I think I could probably get it working eventually, but I can’t afford to spend the next month or two fiddling with it – I have a sample exchange deadline coming up in February, so I need to have some actual woven cloth before then! But more importantly, I need to focus on the book, and I can have only one primary focus. This warp is complex and difficult. It’s a challenge. But what I need right now is “comfort” weaving, something pleasant that I can use as a break from writing. At the moment it feels like I’m banging my head against two projects at once. So, much as I hate to do it, the shadow weave warp has got to go. Which does not mean that I’m giving up on the project! Far from it – but I’m putting it on hold until the book is a bit further along. I won’t get out the scissors until January (when we return from visiting family), but I’m already thinking about the next project. This is an exciting opportunity to weave something relatively simple and mindless, using up some of my thicker threads. There are a number of yarns I’ve wanted to experiment with for awhile, but was always too deep in some big complicated project to try. I think the first thing to try is the sea turtles. Remember this draft? I had originally intended to weave it up on a 140/2 silk warp with 60/2 silk/cashmere as the “heavy” thread. But I don’t want to put on another superfine-thread warp right now. So I’m thinking I might drop back a notch and weave it with a 60/2 silk ground warp and a 2/30 nm cashmere pattern thread. That will be much easier to weave. I’m thinking a 12″ scarf, which would be quick and easy to thread. Keeping the width to 12″ would also allow me to weave a second scarf using some qiviut (musk ox) yarn given to me by a friend. I don’t have much of it, so every bit is precious – but I think I have enough for a scarf. If I can figure out how to draw it, I’ll likely do a musk ox head – though that might be challenging to make look good, as a preliminary image search suggests that musk ox heads look distressingly similar to a shapeless blob with horns. I need to do something symmetric, as I’m using a point threading. I would really like to use something with an Arctic theme, so if you have ideas, comment away! 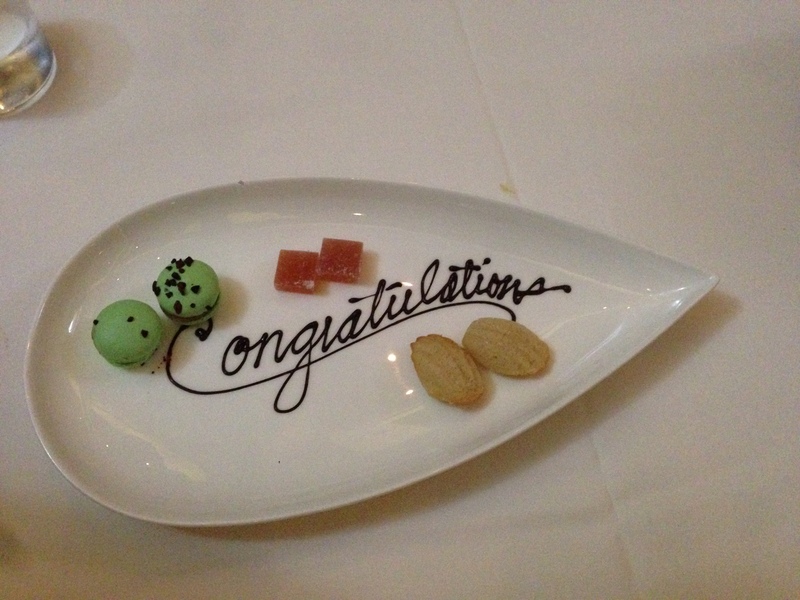 The last week has mostly been spent recovering from the chocolate maelstrom – physically, mentally, and studio-wise. I’m realizing that, much as I enjoy the four intense days of chocolatiering, my body is less enthusiastic about standing up 14 hours a day for four days straight. Next year I will either get in better shape beforehand or else figure out a way to reduce the strain. That said, I’m planning on flinging myself back into the book and the studio shortly. After I’ve gotten the studio and the chocolate prep areas clean, I’ll be writing new chapters, doing interviews, and – oh yes – actually weaving! I expect to have continuing challenges with this warp – but hopefully I’ve had enough time away that I can start afresh. I’m hoping to have it debugged by the end of the month, so I can weave yardage in January. Book-wise, I have started doing my final round of interviews. Tuesday I interviewed a glass artist (Paul Marioni), Thursday I interviewed a ceramicist (Hiroshi Ogawa). I continue to be grateful to all the artists who have generously given their time to the project! I plan to do four or five interviews over the next two weeks, finishing up my interviews. And I’m hoping to write another chapter or two before the end of the month. In January, I plan to focus even more intensely on the book. I’ve booked a lovely cabin near Ft. Bragg (about a three hour drive north of where I live) and will spend a week and a half there, working on nothing but the book. The cabin is cozy, the surroundings beautiful, and there are plenty of restaurants in town, so I don’t need to worry about feeding myself. My intent is to finish the rough draft and the first major round of revisions by the end of the week. Looking forward to my retreat! I’m leaving today for Covelo, a small town in the middle of rural Northern California, to spend three days studying katazome, the Japanese art of stenciled paste-resist dyeing, with John Marshall. I’m really looking forward to it! But Internet access and cell phone reception are spotty at best, so I may be out of touch for a few days. 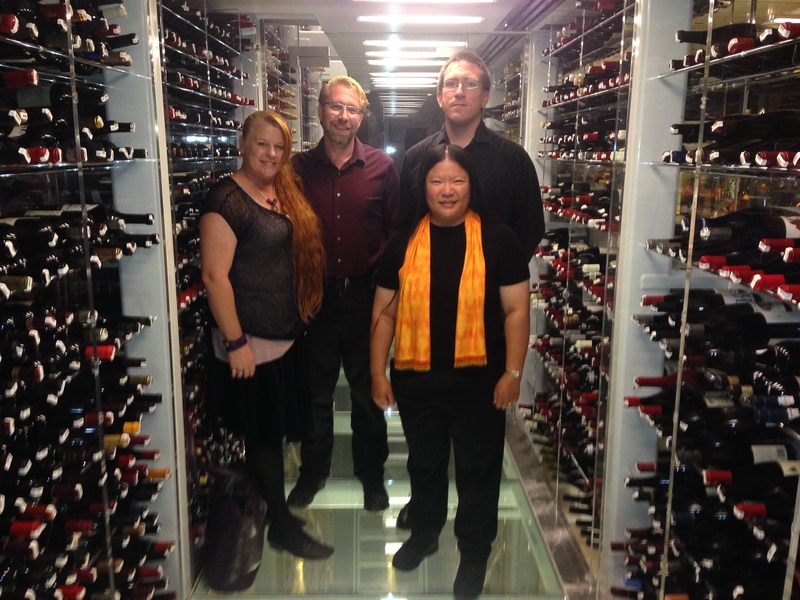 I’ve now completed my first round of interviews – thirteen artisans in all. I’ve decided to break from interviewing for ten days, so I can finish my detailed book outline and also write the fifth chapter, which is about ways of starting a project and what to do if you’re stuck for ideas. There is substantial interview content in that chapter, which will show me more about ways to integrate commentary from other artists with the overall text. I’m very glad I decided to do a bunch of interviews before writing this chapter – it’s greatly expanded the breadth of the chapter, since it now covers a broad range of styles, not just my own. 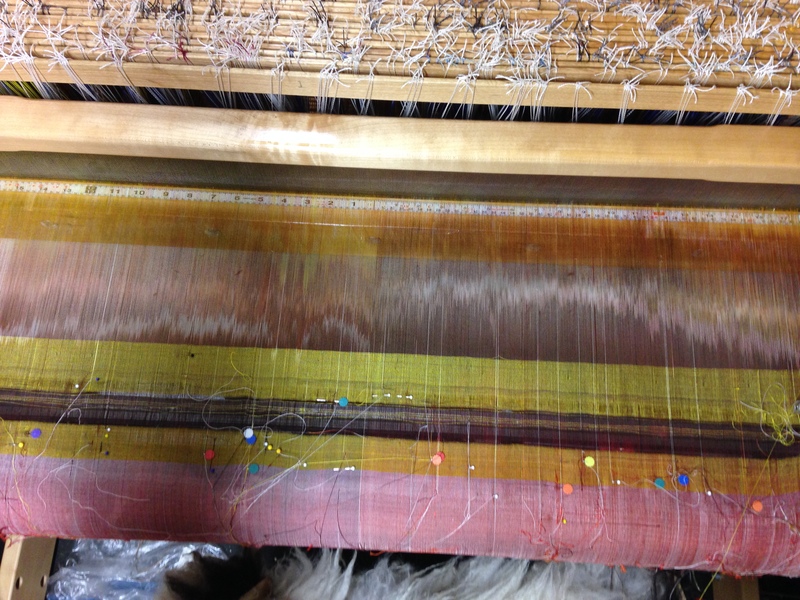 It’s only the first few shots, so the warp ends are still all muddled and the shed is not clean – so I will do some debugging when I get back from my katazome class. I’m looking forward to weaving this warp! 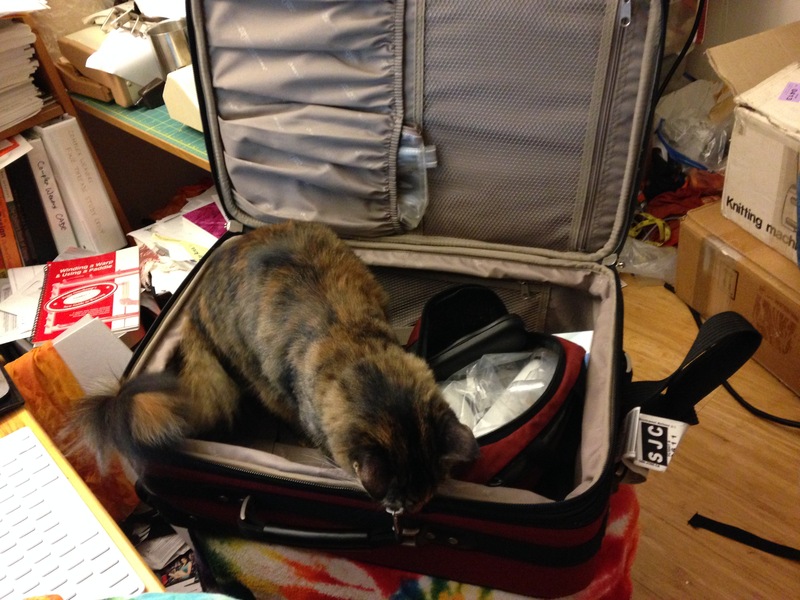 She has a total fascination with luggage. Exotic smells! A new box to sit in! Surely, adventure awaits. So much has happened in the last few days that it’s hard to know where to start! Book-wise, I was getting rather frustrated while waiting for the publisher to get back to me with some contacts to interview. Then it finally dawned on me (DUH!) that I didn’t have to wait for the publisher to set up contacts for me, I could reach out to people myself! So I put together an introductory letter, did some Googling to find people to interview, and started emailing people. To my delight, the vast majority of them have said yes! That is eight people out of ten interview requests – which is not at all bad considering I only started sending out requests two days ago! I am super excited. I am planning to do 30-40 interviews total, so I am about 25% booked already. I’m also pleased to say that I have found someone to transcribe the interviews – my friend and fellow weaver Laura Fry, who transcribed the WeaveCast podcasts, will be doing the transcriptions. Thank you, Laura! My intent is to spend the next six weeks or so interviewing people, then take a couple weeks off for chocolate season (which will also give Laura time to transcribe the interviews), and then start writing like a maniac. I have ten and a half months to turn in the manuscript, so that will leave me eight months in which to write and polish the book. Taking out two months for polishing and slip-time, that comes out to 2.5 chapters per month. That is quite a task, considering I also have to read, take notes on, and organize all my transcribed material. So I think it is safe to say that, while I will continue working on it, Phoenix Rising will not finish next year. Too bad, but the book is also really important to me, and it has a much more pressing deadline. That may not seem like much, but after all the struggles with this warp, it’s HUGE. The next step after that was to knit up a test blank, wash and unravel it, and then weave a sample to determine how many rows of blank I need per inch of weaving. That will allow me to figure out the length of blank to knit for each panel – they’re about 32″ long and change color down their length. 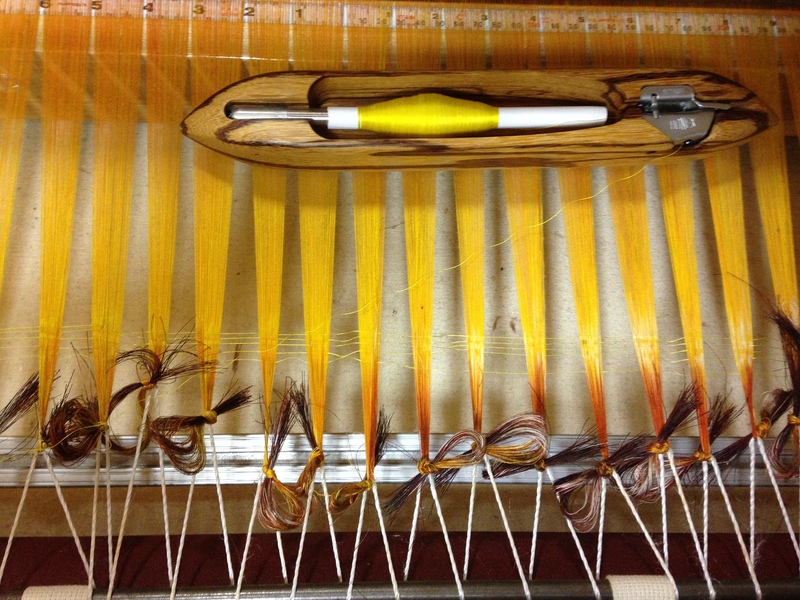 The colors in the weft need to change in the same sequence as the colors in the warp, so accuracy is important. After I got it working, the next step was to plug in the motor. Mike helped me figure out the power etc., and we got it hooked up correctly. We turned on the motor and moved the carriage about a quarter way down the machine. Fifteen seconds later, there was a loud BANG!, and white smoke started coming out the back of the motor. Oops. Mike thinks it might be a bad capacitor, which would be repairable, but we haven’t figured out how to get the case open yet. It might have fried the circuit board, though, which would be much more difficult (and quite probably impossible) to repair. I’m crossing my fingers that it’s repairable; we’ll find out more this weekend, when we finally have time to work on repair. So that’s where I am. I have two interviews booked for Saturday, and three more next week – which doesn’t sound like much, but I want to spend some time researching each interviewee first, so I’m properly prepped for the interview. So I am basically booked for the week. I also have fifteen pounds of quinces, fourteen pounds of pears, and fifteen pounds of lemons that are begging to be made into various flavors of jam. That takes a back seat to the book, but I’m still hoping to get some of those done on Sunday. They are mint chocolate macaroons, peach fruit jellies, and vanilla madeleines. Very tasty. 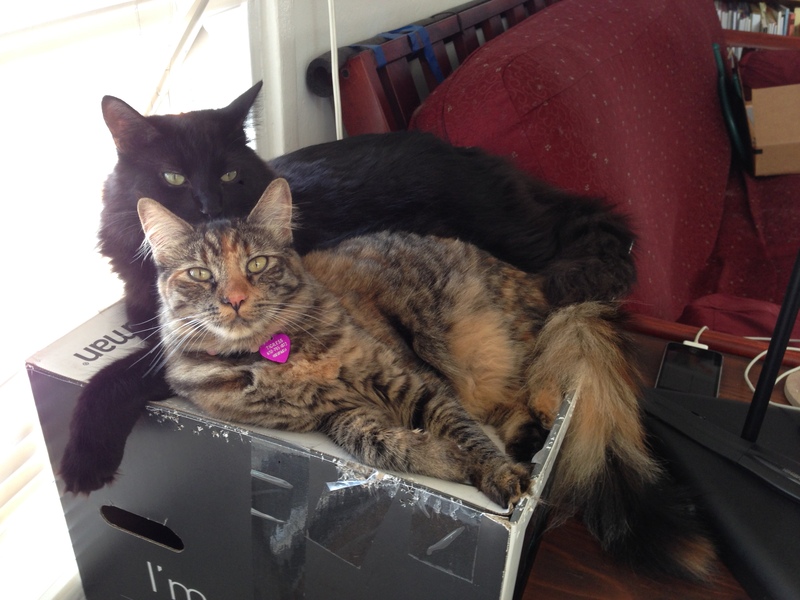 And, the cats. I’m grateful that they get along so well – in addition to chasing each other all over the house, they love to snuggle up to each other, as you can see here. And that’s it until next time! 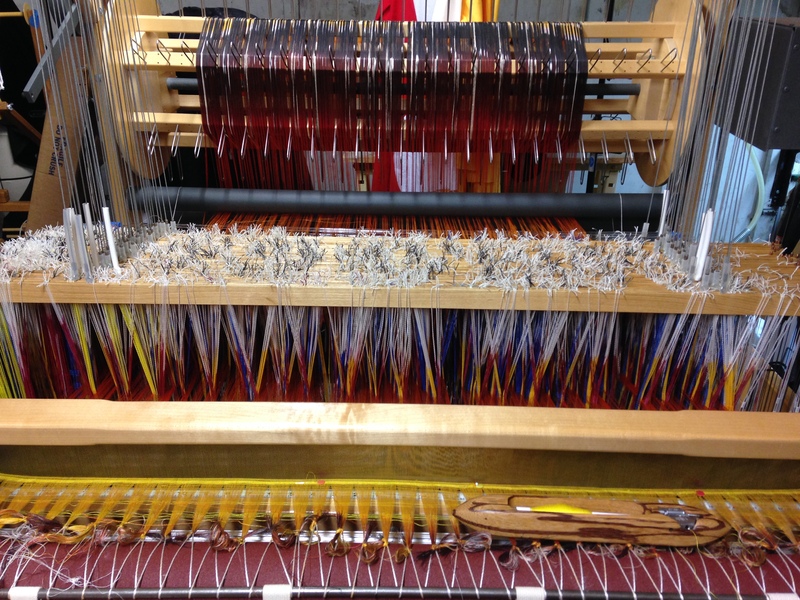 The last few days have been a grim struggle with the fine-threads warp. The threads were sticking together, so I sized it. Whereupon the sizing glued the threads together (as I should have anticipated). I spent a few days un-sticking the threads, but to no avail – they are still sticking together, and I don’t think it’s the fault of the sizing. I had sett at 80 ends per inch, based on a sample from the Fine Threads Study Group that was woven at 90 ends per inch, but I think it’s still too dense. Peggy Osterkamp’s sett tables in Winding a Warp and Using a Paddle, which are the best sett tables I’ve encountered, suggest a sett of 62 (!) for plain weave at a reasonable density. Now, you can get away with a lot more variation in sett in fine threads than in thicker ones, but the difference between 80 and 62 is pretty dramatic. I think I will re-sley to 64 ends per inch, 4/dent in a 16-dent reed. But I am not looking forward to re-sleying. 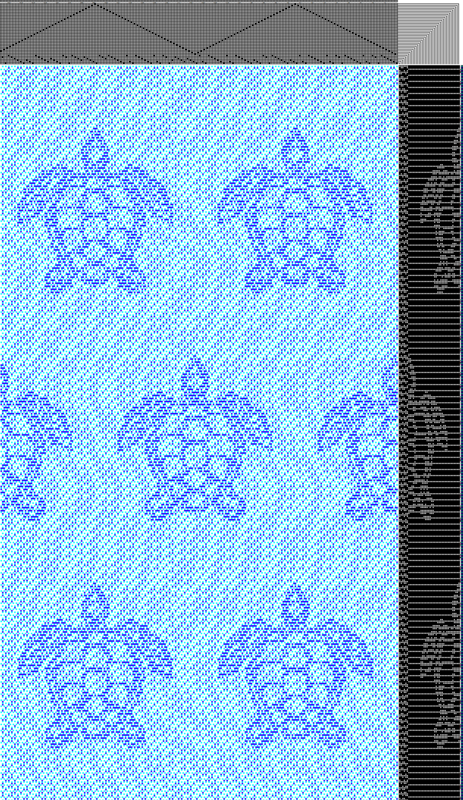 Another eight hours plus debugging before I can sit down and weave. 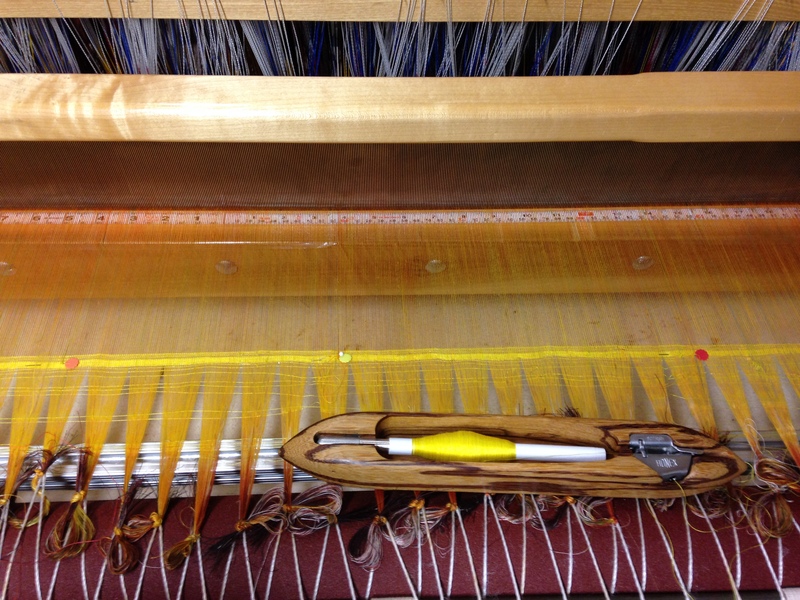 Plus my 36″ warp will now be 45″, which I am not sure I can weave without a fly shuttle. More things to try, I suppose! At worst I can always drop some threads off the edges. Perhaps the delay isn’t such a bad thing, though, as I may be changing knitting machines! Faced with the prospect of knitting miles and miles of 120/2 silk into blanks, I had started looking for motor attachments for my knitting machine. 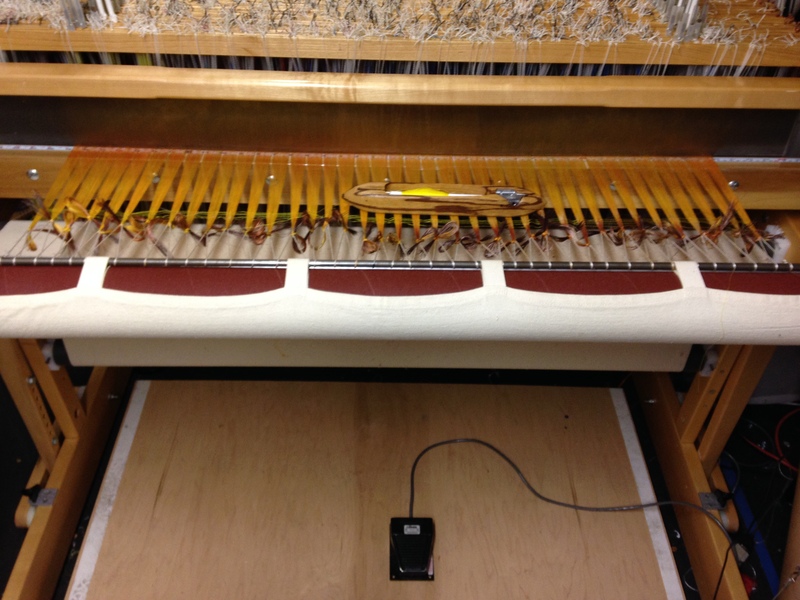 Eventually I found a White 1602 knitting machine – with motor – on sale on eBay. It had been mislabeled as a White 3800 (which doesn’t exist), which perhaps explains why no one was bidding on it, but I got the machine + motor for about $400. 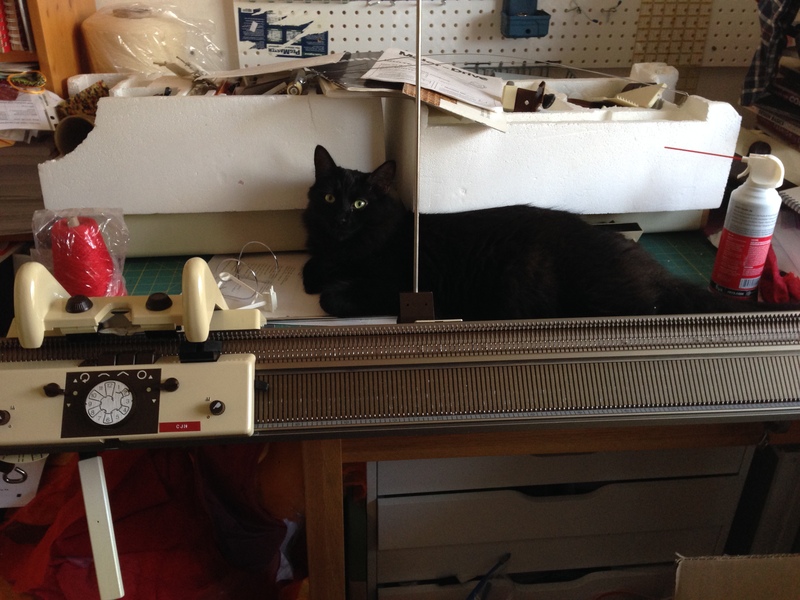 When it arrived, I found that rather than the petite, simple, single-bed knitting machine I expected, I had a double-bed, electronic monstrosity with all sorts of gizmos in addition to the motor (intarsia carriage, garter bars, etc.). Egad. I’m guessing it’s worth at least $1500-2000+, if it’s tuned up and working properly. However, the bells and whistles are completely wasted on me since all I want to do is knit stockinette. I’m sure I will incur the karmic wrath of machine knitters everywhere by wasting the potential of such a machine, but really, all I want is a simple motorized unit to knit stockinette. So anyway, I need to figure out how the machine works and whether it needs repairs. Since I know essentially nothing about knitting machines, I’ve made an appointment for this coming Saturday to get it inspected (and repaired if necessary). All that means that I won’t be able to knit sample blanks and get started on the “real” weaving for a week anyway. Which means that re-sleying, while frustrating, won’t slow me down in the grand scheme of things. Meanwhile, in book-land, I have started putting together a project plan. The resulting schedule is pretty tight – a month and a half to conduct interviews and write a prototype chapter, two months to write the next two chapters (that includes a month off for chocolate season + holiday travel), and five months to write twelve more chapters. After that, two months of polishing, following which I’ll turn in the final manuscript. It doesn’t sound completely gruesome, but there isn’t much room in it for slacking, either. Anyway, I’m talking to the publisher about my project plan tomorrow or Tuesday – hoping to get that settled so we can get to work immediately. Not a moment to lose! As a project manager, I simply loathe last-minute heroics – especially if the “hero” working late nights happens to be me. So I’d rather get started immediately and set a steady pace now, rather than stressing over it later. As if that weren’t enough, I’ve been bitten by the jam-making bug again. This time it’s six pounds of Concord grapes and fourteen pounds of pears, plus fifteen pounds of quinces that I’m picking up on Tuesday. Plus some Eureka lemons to add the necessary tartness. I’ll be making the Concord grape jelly today, but the pears will need to ripen for a few days before they’re ready to use. So I’ll probably be making pear jam and quince marmalade next weekend. Gotta do something to keep myself out of mischief! And, finally, in cat-land, here is a video of Fritz engaged in one of his favorite activities: drinking from the faucet! For some reason, even though he has his own drinking fountain (a cat water dish with a pump that continuously circulates water), he loves fresh water from the bathroom faucet. I am always amazed by how deftly he drinks from a running tap. I feel a bit guilty about giving him water that way when there’s a drought on, but our overall water usage is down 25% from last year, since we’ve switched to drip irrigation and stopped watering the lawn, so I suppose a few small indulgences are tolerable. And he does enjoy fresh water!